Congratulations to Katie Costello and her very special Pet Partner, Vickie! 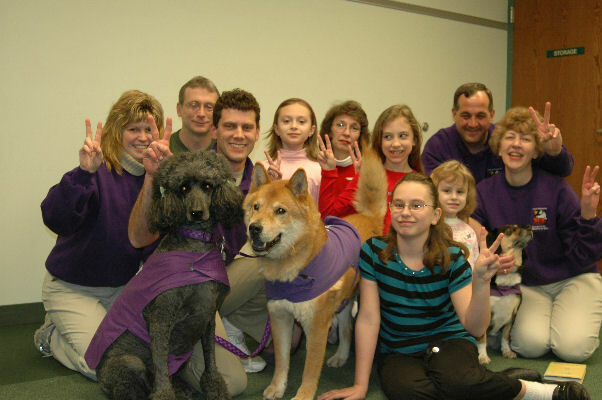 They won the Delta Society Beyond Limit Award, 2007 for Rescued animal. We are very proud of you both! 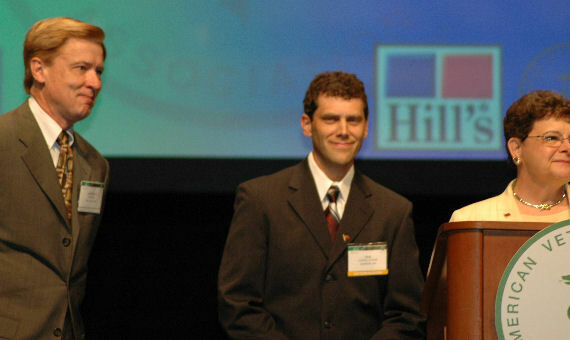 Our very own veterinary advisor, Dr. Sam Costello, Jr. was honored at the AVMA awards in July 2007 for his dedication and betterment to the human-animal bond. Dr. Costello won the national prestigious "Bustad Award" given by Delta Society and the American Veterinary Medical Association. Congratulations Sam! We all knew you were deserving! Dr. Costello also received an award from the Ohio Veterinary Medical Association for Most Distinguished Veterinarian of the year in 2006! We are very privileged to have you as our Veterinary Advisor for K-9s! If you have any news you would like to see here, please email Lori with the details. The Hubbard Public Library and K-9s For Compassion have teamed up for this wonderful program. Interested children can sign up to read to the K-9's dogs at the library. Contact Katie Costello or the Hubbard Public Library for more information. Please visit our Testing Procedure page for details of our next evaluations. We have re-formatted the way the yearly vet checks are done. We will NOT be doing any vet checks at Town & Country Vet Clinic. During the testing dates, members will be able to schedule their animals' vet checks. If you are unable to attend the set testing dates, you will have to have the vet checks done at cost at your personal veterinarian (with instructions from the group on cultures). All group members are now required to pay for their own cultures on their animals. Dr. Costello will still acquire the samples for you at the yearly vet checks, but you will be asked for a check for the lab fees. If your animal is due for its yearly exam or a recertification,contact Lori Baker to set up an appointment time. Please remember to turn in your Delta renewal packets to Katie when you are due for renewal. If you send them to Delta on your own, you MUST give Katie a copy for your file. Our 2009 Calendar is available now! They are wonderful this year. If you would like to purchase one, please contact Katie at 330-534-2001 or email us. Our Calendars have become very popular and people start asking about them earlier and earlier every year! If you own a business and would like to advertise in our 2009 Calendar, please contact Katie Costello at 330-534-2001 for information and pricing schedules. As always, K-9's For Compassion appreciates any support from the community! As a non-profit organization, fundraisers and donations are our only source of income. Without the community's support we could not provide the programs we do to hospitals, nursing homes, and schools. Thank YOU! Please remember to contact Anthony Russo with any special volunteer hours you have during each month. Please turn them in by the end of the month that you accumulated those hours. You need only report special hours (hours that you are doing anything other than visiting at a nursing home or hospital). Also, if one person from each facility would please pick up the cards and send the Tony each month, your hours can be tabulated correctly! Thanks for the help! Katie and Cheryl have started a library. If you are interested in borrowing any of these books, call or email Katie. K-9's Currently has 7 of our own evaluators. Contact any of them with questions concerning evaluations. Contact any of them with questions about Team Training Courses. As always, I am looking for anything you'd like to see on this site. Feel free to email me your stories, pictures or any club related info for inclusion on the webpage. Last updated: March 17, 2009.